Daylight savings time means moving our clocks ahead and losing an hour of sleep. For some of our older loved ones, losing that one precious hour of sleep can have an even greater impact if they are already dealing with dementia and sleep patterns that are changing. This is a good time of year to check in on how they are sleeping and how to help them get a good night’s rest. A typical sleep cycle includes periods of lighter, dreamless sleep and then periods of REM with active dreaming. These cycles repeat several times throughout the night. As we age, our sleep patterns change. Most seniors complain that it is harder for them to fall asleep and they wake up more often during the night—on an average of three to four times each night. Many find that they are waking up earlier in the morning and the transition to waking up is more abrupt. Others may complain that they sleep more lightly and restless than when they were younger. Older people spend less time in deep sleep because of anxiety, discomfort, pain, dementia and needing to get up to use the bathroom during the night (nocturia). 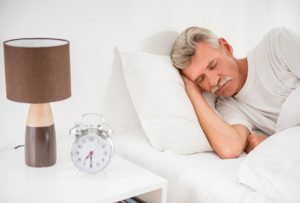 Sleeping difficulty can significantly affect seniors, especially if they have dementia. Although their total sleep time may not have changed dramatically, the quality of their sleep leaves them feeling deprived and anxious. Chronic insomnia is a leading cause of depression in the elderly. And depression, in turn, disrupts the sleep pattern which can cause a vicious cycle of insomnia. Antidepressants may be helpful to relieve symptoms. Consult with your loved one’s physician. Some medical conditions can contribute to poor sleep like restless legs syndrome, acid reflux, heart disease, dementia, and sleep apnea. Prescription sleeping pills can be used for a short time to break this cycle but only if recommended and monitored by their physician. Sleep medications can lead to addiction in some people, so sleep aids should be used with great care. Go to bed at the same time each night and wake up at approximately the same time every morning. Avoid caffeine, such as coffee, chocolate, tea, and colas, for at least four hours before your bedtime. Avoid drinking alcohol which may help you fall asleep but can disrupt your sleep pattern during the night. Moderate exercise during the day can lead to a more restful night’s sleep. Do not take naps during the day. If you must, limit your nap to one half-hour. Have a relaxing nighttime routine–turn off the television, computer, and don’t bring your mobile phone to bed. Read a book or listen to soothing music until you feel drowsy. Perhaps try a warm bath. A glass of warm milk contains a natural, sedative-like amino acid that may help you feel sleepy, or a light, healthy snack can help some people. Avoid tobacco close to bedtime. Never smoke in bed. Some find that ambient noise machines can be helpful or an eye mask or blackout shades to keep out the light. Talk to your physician if you are worried that your medications are causing sleep issues. At Aegis Living, we wish you sweet dreams and a restful night’s sleep!